عندما تزور بريسبان, ستشعر أنك في بيتك في Airport Motel الذي يقدم لك إقامة متميزة و خدمات عظيمة. يقع الفندق على بعد 6. Km من مركز المدينة، ويؤمن الوصول إلى أهم مراكز المدينة. يشكل هذا الفندق ملاذاَ مريحاً للاسترخاء ويمنح زواره فرصة للاستجمام والتجدد، وهو يقع على بعد خطوات من المعالم السياحية الكثيرة للمدينة كمثل: Eat Street Markets, رصيف بورتسايد, Brisbane Cruise Terminal & Portside. إن الخدمات التي يقدمها Airport Motel تضمن للنزلاء إقامة مريحة. إن واي فاي مجاني في جميع الغرف, خدمة التنظيف يوميًا, خدمات بريدية, خدمة سيارات الأجرة, مجهز لذوي الإحتياجات الخاصة هي جزء فقط من الخدمات التي تميز Airport Motel عن باقي الفنادق في المدينة. لقد جهزت هذه الإقامة الفندقية بعناية فائقة لتوفر مستوى عالي من الراحة. في بعض الغرف يجد النزيل شاي مجاني, مناشف, قهوة فورية مجانية, تلفزيون بشاشة مسطحة, بياضات. يقدم الفندق مجموعة واسعة من وسائل الراحة المتنوعة، كمثل: مسار جولف - ضمن 3 كم, حمام سباحة خارجي, مسبح (للأطفال), حديقة. إن كنت تتطلع إلى إقامة مريحة وهادئة في بريسبان، فستجد في Airport Motel بيتك الثاني. تتاح انتقالات المطار مقابل رسم إضافي. يرجى الرجوع إلى علامة التبويب "معلومات مفيدة" للاطلاع على الأسعار ولاحظ أن السعر هو لشخصين. يرجى إبلاغ العقار بتفاصيل رحلتك الجوية بعد إتمامك لعملية الحجز. Hi Richard, thank you for your feedback. We aim to please and happy that you had a comfortable stay. Hope to see you again soon. Glad you had a pleasant stay Art and thank you for you kind words. We hope to see you back again for your next cruise. The management need to spend money on getting their lift fixed. Also the rooms were a bit grimy in the baths and wardrobes. We stayed in 2 rooms, 1 on our way to Brisbane and 1 on leaving Brisbane. What is the deal with limited cutlery in the drawers? We had 3 knives and 3 teaspoons in one room and the other had 3 knives and 3 dessertspoons. No forks whatsoever. Thank you for your feedback, it is important to know our guest's thoughts. We are sorry that the lift was out of order when you stayed, we were waiting for a new motor and is now back in action. All rooms have had a thorough spring clean in November. There is usually only teaspoons and knives (in case you want to use the toaster) in the rooms. Awesome staff nice accommodation and clean facilities. Would definitely stay again in a heart beat. Hi Stanella thank you for your feedback. We aim to please and happy that you had a comfortable stay. Hope to see you again soon. What I appreciated the most was the cleanliness. The whole room was very clean. The decor was current and tasteful. I liked that there was a refrigerator and amenities for coffee/tea. My stay was pleasant, although there some caveats: while all the staff I encountered went above and beyond to please, the two minor areas to be aware of is that I could hear any noise in the hallway, and even the person moving around in the room next door. The room had a very quiet air conditioner- which was much appreciated, but the "free internet access" is limited to 400 mb per 24 hours; good luck if you can read all emails and attachments in that miserly allotment. While there were generous amenities in the room including tea/coffee supplies, refrigerator, iron and ironing board, hairdryer, extra pillows and blankets, I really missed a microwave! The location feels homey and safe, and is 50 meters from a bus stop, a half kilometer from a train stop, and a 10 minute walk to Brett's Wharf ferry terminal. There are no restaurants close by; but it is an 8 minute walk to a grocery market at Portside. I would stay there again - knowing I will be dining in the room - on cold food. Plan to buy your own data plan (elsewhere) if you need any real access to the internet. Arrived well ahead of booked arrival but staff had already checked flight schedule and had a room being prepared for me as I arrived. Very friendly staff and airport shuttle service. Will make this my regular Brisbane transit accommodation. We had a nice, though short, stay at the Motel. It was very easy to get to in a taxi from the Airport and had a nice eating area close by to which we could easily walk with our 7 children, ages 3 months to 12 years old. We all enjoyed the pool as well, even if it was a bit small (for our large family, at least)! We would stay here again in a heartbeat! Room was good - not ultra-modern or anything but certainly clean and had the facilities we were looking for. They're looking after the car while we're away (for about $7 per night) and when our airport bus passed without picking us up (we thought) the staff were great in immediately making sure we were catered for ... even to the extent of offering to take us if the bus company had forgotten us. A nice clean comfortable place that is good for a brief layover. The room was small but adequate (I just wanted a place to sleep and shower between international flights). The shuttle service (for an extra fee) was convenient for departing but there wasn't any obvious way to arrange it for arrival. The motel advertises that it has airport pick ups but in practice that doesn't really seem to be on offer. Coffee and tea makings (sans creamer - fortunately I had my own) were available in the room. We arrived a bit early but that was no problem, we were checked in immediately. The lady on reception was very friendly and sorted out our airport transfers and extended car parking. Our room was clean and comfortable, the bed was excellent. 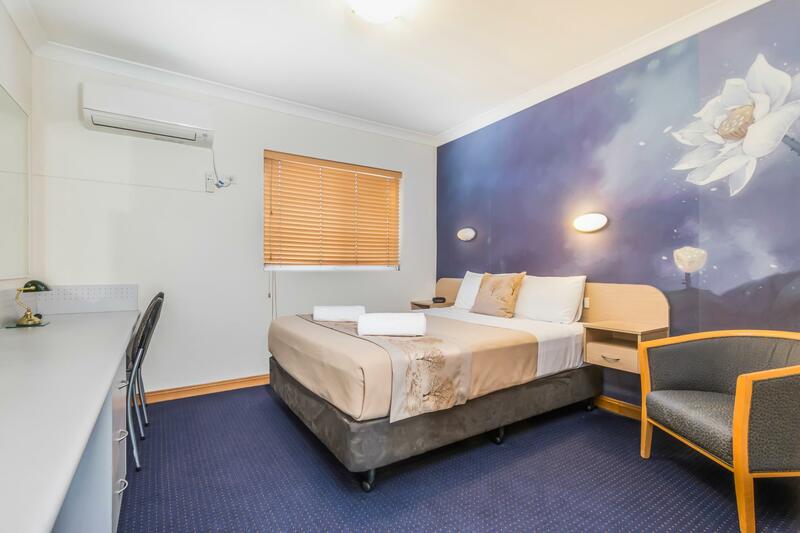 The motel is located right on busy Kingsford Smith Drive which is great for the airport and cruise terminal, but there is constant traffic through the night. The rooms are at the back and away from the traffic, but if you are a light sleeper you mayl still hear the traffic and might want ear plugs. We were staying for 1 night, but had booked our car into their car park for 3 nights while we flew away for the weekend. The car parking was very cheap and our car seemed to have been completely secure during our absence. We would definitely stay here again. The room was noisy because of its proximity to the main highway. However, the staff were very helpful and the motel is very close to some great restaurants for evening dining and early breakfast before catching the plane. 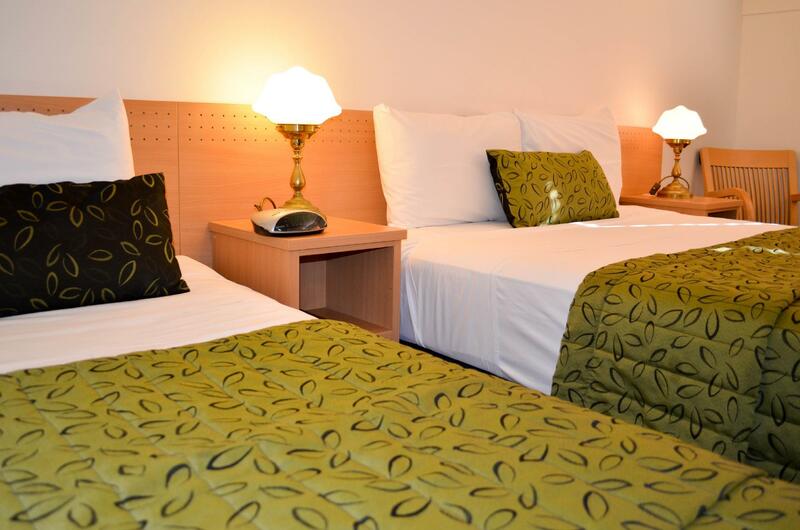 A very affordable overnight option which we will repeat again but in a room away from the road next time. 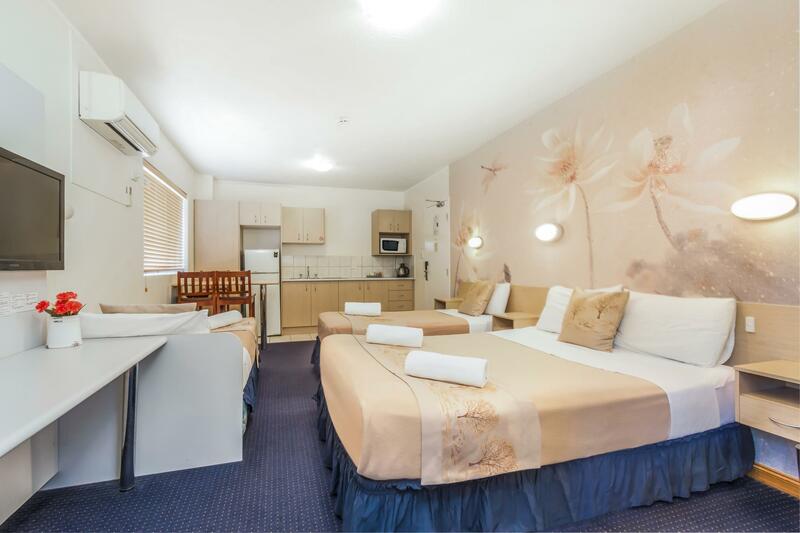 we stayed for a night as a transit to Gold Coast and very satisfied with the accomodation. Thank you for your kind words Zainatunnisa, we hope you choose to stay with us again on your next visit to Brisbane. I wont suggest anyone to stay in this motel because we checked in at 1am and were told to check out before 10am sameday. I was with kid's at least should have allowed to check out at 1pm ir afterwards. Waste of money. Hi Vinita, sorry for your experience but check out in most motels is 10am. We do extend until 11am free of charge and a later checkout could have been arranged if you had let us know in advance. We had issues with our booking both times we stayed. There was a language barrier which made things even more difficult when after a long day we just wanted to get to our room and relax. They tried to charge us extra both times for a third person when I had made the booking for 3 people. The booking was confused when we arrived as I had booked a 2 bedroom and a 3 person room. When I booked the 3 person room it was not mentioned the third person had to pay extra. The service was bad and there was a language barrier. Not a great start to our trip. It was eventually sorted with an 'upgrade'. Closer to the airport that many places and for the price a viable option. However I could see no other reason to stay there. a place to sleep before you fly out early the next day.